Ran Xia reviews Catherine Filloux’s latest play about women in detention. whatdoesfreemean? by Catherine Filloux is the story of an African American woman in prison for a non-violent crime. Mary (Lisa Strum, a powerhouse of a performer) was given a long sentence for selling crack cocaine. In the play, we see aspects of her life behind bars: she studies Greek mythology and European history for her GED tests, using mnemonic devices that include song lyrics and word associations; she strives for more by taking up drawing; and she takes an interest in coding and decides to learn html and build her own website. 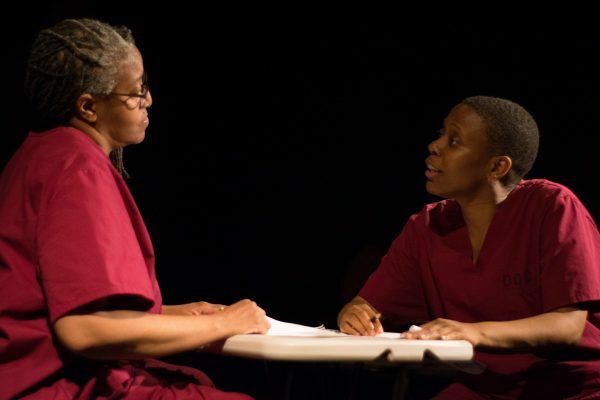 Perhaps most importantly, we witness the bond she develops with her friend, Ann, a fellow inmate portrayed by Brenda Crawley, whom I last saw as the nurse in the Eagle Project’s adaptation of Uncle Vanya set in a Native American community. Crawley’s nuanced performance brings to life a character who is sassy and vulnerable, one we could instantly fall in love with and whom we can mourn when cancer takes her life. Ann’s death triggers a conflict between Mary and the officers at the facility, and Mary is put in solitary confinement for an extended period of time. Through her memories, as well as her hallucinations, we learn about Mary’s past, the strains and trauma, both physical and psychological, caused by her isolation. The piece beautifully dissects a complex character whose criminality and morality should not be viewed as simply black and white and puts the effectiveness, as well as the inhumanity of our prison system under scrutiny. Mary is tortured by the prison officers, who are mostly portrayed as villains; even as the audience entered the space, one Officer yelled at spectators for not taking their seats properly, or directed them, with unnecessarily high intensity, to sit in certain areas. All of this might be a choice to set up the context for the piece but makes the production hard to watch. A contrast to the dark subject matter and graphic depiction of prison violence is a particularly brilliant and comedic scene where Mary converses with a mouse (a superbly versatile Liz Morgan) who has been tested by scientists to prove how solitary confinement causes long term negative effects on brains. “They have to look at mice to know that solitary confinement is bad?” Mary asks as the nervous mouse confesses that she will never be able to enjoy the taste of cheese, or anything she used to take delight in, after just 48 hours in solitary. Though Filloux has written a sincere, provocative piece, I was at times distracted by its frequent tonal shifts, from realistic to absurd, from satirical to solemn. I applaud the fine use of the production’s minimalistic set (by Phoebe Mauro): two metal chairs become everything including the sectional in a library, the bars of Mary’s solitary confinement cell, and more. However, the use of projection seems to me unnecessary. For instance, in a memory scene where Mary remembers a beautiful day at the beach with her mother, Sadah Espii Proctor’s atmospheric sound design is already transformative enough to convey the environment; a video projection of crashing waves makes the scene presentational rather than mystical. Filloux’s play illuminates a crucial social issue. This is the second play I’ve seen in the past year or so by the human rights playwright about a woman in captivity, the previous one being Kidnap Road at La Mama. A woman lying in a cage has become a haunting, recurring image that I now associate with Filloux. This thought provoking piece provides a platform for a much-needed discussion of the differences between what’s just, what’s lawful, and what’s right, between crime, punishment, and rehabilitation. It’s important that we hold the criminal justice system accountable and consider how it may be detrimental to our society.A few weeks ago Theater of War presented a reading of Prometheus Bound at Rikers Island, an abusive prison facility that is gradually being shut down thanks to the CLOSERikers campaign and the increasing awareness that the exploitation of inmates is a new form of slavery. Filloux’s play opens another window to a large-scale issue that deserves more attention. whatdoesfreemean? runs to July 22, 2018. More production info can be found here. Ran Xia is an interdisciplinary theater artist. Her works have been produced at IRT (Pomegrenade), HERE, Dixon Place, The Brick ([ai]), The Wild Project, The Tank (Echo; Siren, also directed Independent Study, The Tallest Man in the World, etc.). A frequent collaborator of Exquisite Corpse Co. (audio/visual installation Echo at the Memory House, on Governors Island), a current Resident Director at The Flea, and a resident artist at Access Theater. Assistant Directing credits include: The Great Leap (by Lauren Yee, Dir. Taibi Magar at the Atlantic Theater), and Refrigerated Dreams by Carrie Mae Weems, Nona Hendryx, Francesca Harper, and Niegel Smith at Joe's Pub.